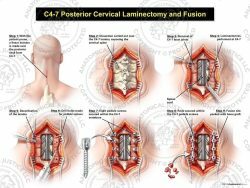 This exhibit features eight illustrations detailing posterior C3-7 fusion of the cervical spine. The procedure begins with a posterior midline incision over the cervical spine, exposing C3-7. Next, the left facet joints are decorticated, holes are drilled for screws, and a trough is burred through the laminar-facet junction. 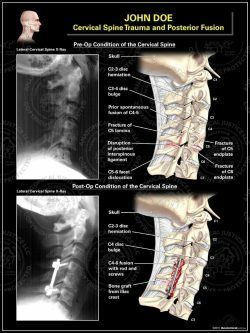 Left pedicle screws and a rod were placed in the C3-6 lateral masses. 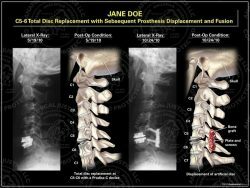 The right facets are then decorticated, laminar-facet junction trough burred, and pedicle screws placed in the C3-6 lateral masses. 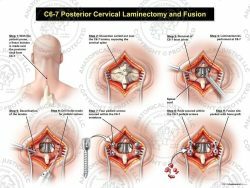 Total laminectomies are performed from C3-6 and bone graft is packed into the right facet joints from C3-7. The right rod is then placed, and bilateral C7 pedicle screws are affixed. 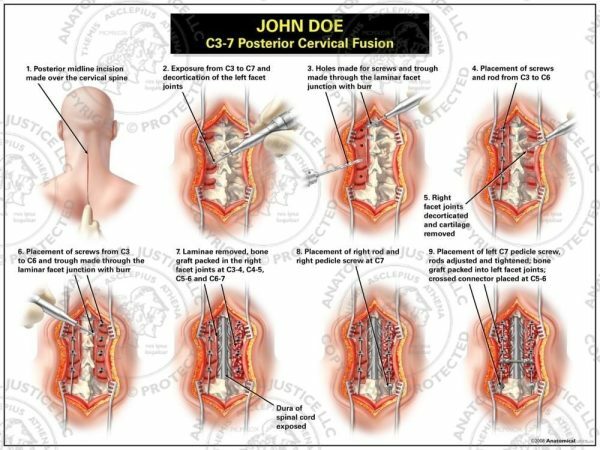 Bone graft is packed into the left facet joints, and a cross connector is placed between the rods at C5-6.